Air tanks are part of the pneumatic brake system. They store the produced compressed air and deliver this when needed, through the respective valves, to the different users, e.g. the braking system or level control. Air tanks of the DT® Spare Parts brand are made of aluminium or steel. The air tanks are available in diameters of up to 396 mm, have a capacity of up to 120 litres, and are resistant to pressures of up to 15.5 bar. Through the use of steel of the highest possible quality and optimum construction, weight saves of up to 6.7 kg are achieved, compared to conventional air tanks. All air tanks of the DT® Spare Parts brand are manufactured in accordance with the standard EN 286-2 and marked accordingly. In addition, a CE marking can be found on each tank. A powder coating on the inside of the air tank protects the tank against corrosion. This coating is designed for a service life of 15 years. 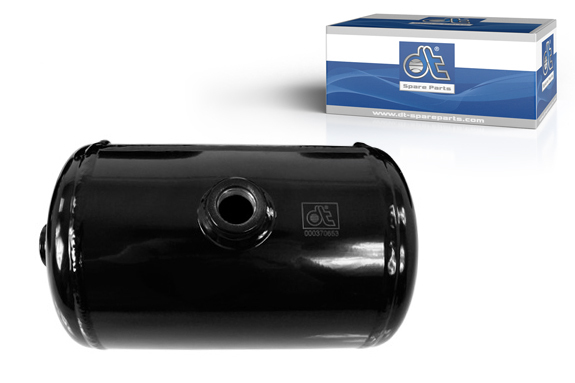 In the case of air tanks of the DT® Spare Parts brand, a complex outer coating ensures optimum protection against corrosion and environmental influences. To apply the outer coating, the tanks are first degreased or shot-blasted. Then follows a zinc phosphate coating and an over-paintable primer is applied by powder-coating. The thickness of the layer is at least 60 μ. To optimise corrosion protection on the threaded rings, a plane surface lacquering is applied. In order to ensure a consistently high quality of air tanks of the DT® Spare Parts brand, extensive tests are conducted. These include pressure testing, corrosion testing and coating thickness testing. To ensure corrosion resistance, salt spray tests are carried out. In this case, the inner coating is tested for at least 400 hours and the outer coating for a minimum of 1 000 hours. In addition to air tanks, DT® Spare Parts offers all the accessories required for replacement, such as hose pipes, drain valves or tensioning belts.